There is a certain amount of uncertainty and anticipation for your first baby. You have countdowns everywhere, you tell people how far along you are by the week and half week (I'm 30 1/2 weeks! I'm three days from being 32 weeks!) and as you pack your hospital bag and put away those little newborn diapers in the changing table you feel ready. Come on, baby. We're ready for you. So far with the second baby, things are much different. We've gone through the drill once so a lot of the anticipation has cooled, and instead there is a slight sense of dread. 5 more weeks! Eek! Can we possibly get everything done? It seems like to prepare for baby this time, my husband and I are doing anything BUT preparing specifically for the baby. Newborn clothes are still unwashed, diapers have yet to be purchased, but my husband and I are frantically finishing projects, starting new projects, refinishing furniture and getting knee-deep in things that are difficult to do with round-the-clock feedings, diaper changes and general baby cuddling. It's starting to feel like having a newborn will be relaxing after all of our "preparation". In the midst of all the craziness at our household, dinners are one of the few times of the day where we sit down instead of eating on the run. If my husband has to work late, some nights it is just me and the toddler, but we still sit down together and I hear about her day (mostly one word sentences like, "Ball! Outside! Orange! Pink!") and enjoy some time relaxing. 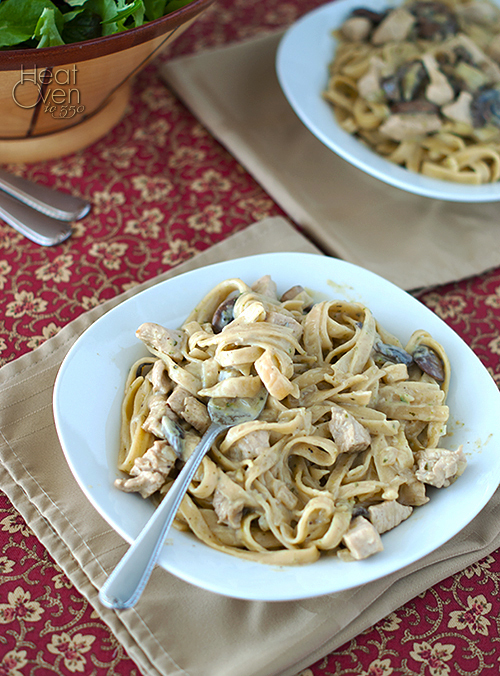 When it comes to relaxing over dinner, nothing beats this basil cream pasta, my friends. Nothing. It is fast and easy to make, and oh, so creamy and delicious. Think pesto meets alfredo and that gives you an idea of the taste, but it is much less fussy than that. 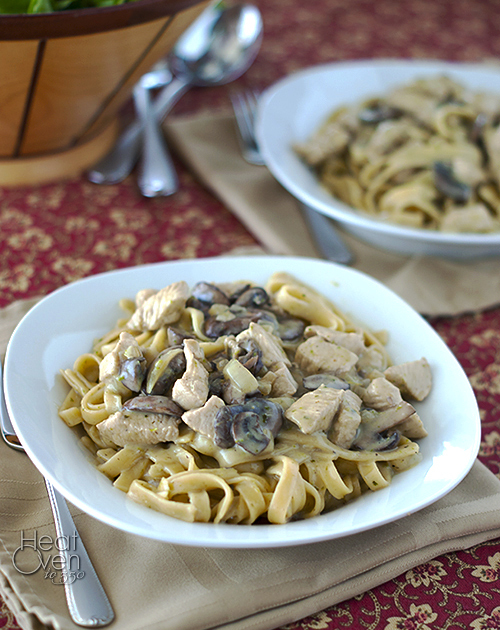 It is an easy, comforting meal full of basil, mushroom and chicken goodness. I am not lying when I say that my daughter always asks for more of this dish. And I'm not lying when I say that I wish she wouldn't because it means there is less for me. Try it and see if it doesn't quickly enter your own dinner rotation. In a large skillet over medium heat, heat 2 tablespoons oil. Add chicken, onions and mushrooms and cook until mushrooms have given off their liquid, about 8-10 minutes. While chicken is cooking, melt 3 tablespoons butter in a large saucepan. Stir in flour until smooth. Slowly add chicken broth, whisking after each addition. Stir in half and half and basil. Bring to a boil and cook and stir for 2 minutes to thicken. Season to taste with salt and pepper. Add chicken, onion and mushroom mixture to basil cream sauce. Serve over cooked fettuccine. Baby #2 was very different for us, too. We weren't so nervous…but what I was nervous about was dealing with a baby and a toddler. Suffice it to say, I got through it! Having a meal like this is a wonderful way to end the day -- I love that pesto cream sauce! That looks like pure comfort food. I actually had to laugh because I literally picked up a crib and dressing table on the day my daughter was born - she was two weeks early, so I had my baby shower gifts still in boxes and bags and had absolutely nothing ready for her - ha! Now she's going to be 22 in a couple weeks - it went by so fast! Mmm, this looks tasty. Don't worry, you'll get it all done in time! I made this for my 3 boys and they loved it! I upped the basil quite a bit and used penne (because it is easier for them to eat than long floppy fettucine). Thanks for another great recipe!